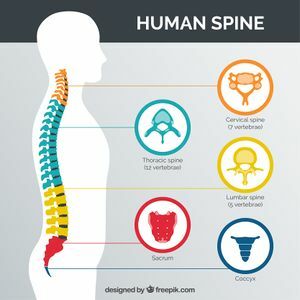 The spinal cord is the major conduit and reflex centre between the peripheral nerves and the brain, and transmits motor information from the brain to the muscles, tissues and organs, and sensory information from these areas back to the brain. The spinal cord in an adult is approximately a 45 cm long, cylindrical structure that is slightly flattened anteriorly and posteriorly. The spinal cord lies within the vertebral canal, extending from the foramen magnum to the lowest border of the first lumbar vertebra. It is enlarged at two sites, the cervical and lumbar region. Its upper end is continuous with the medulla; the transition is defined to occur just above the level of exit of the first pair of cervical nerves. Its tapering lower end, the conus medullaris, terminates at the level of the L3 vertebra in neonates, and at the level of the L1-2 intervertebral disk in adults. The conus medullaris is continuous at its lower end with the threadlike filum terminale, composed mainly of glial and connective tissue, which, in turn, runs through the lumbar sac amidst the posterior and anterior roots of the spinal nerves, collectively called the Cauda Equina (“horse’s tail”), and then attaches to the dorsal surface of the coccyx. 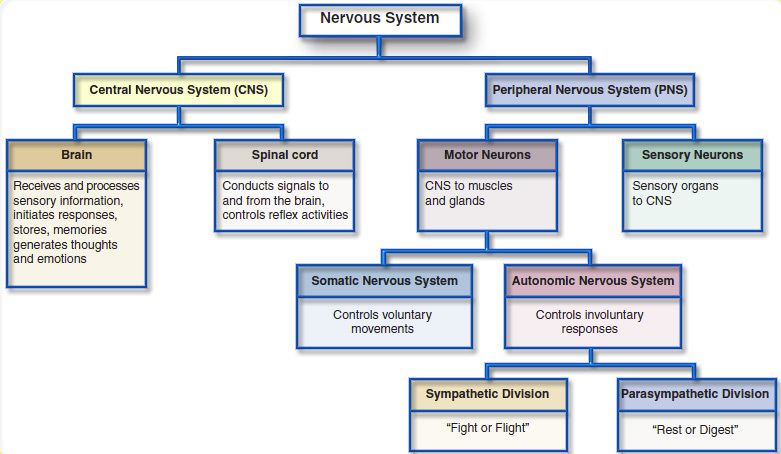 Sensory Nerve Fibres enter the Spinal Cord via the Posterior (Dorsal) Root. The cell bodies for these neurons are situated in the Dorsal Root Ganglia. Motor and Preganglionic Autonomic Fibres exit via the Anterior (Ventral) Root. 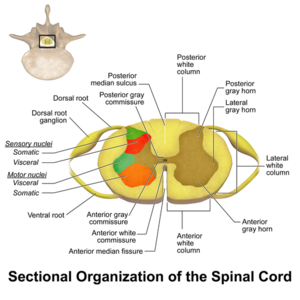 The spinothalamic tracts sit within the dorsal horn laminae I,III,IV,Vof the spinal cord. Most of the fibres cross the midline at or near the level they enter the spinal cord. The lateral spinothalamic tract carries information about pain and temperature, and the anterior spinothalamic tract carries information about crude touch. The largest ascending tract, the fasciculi gracilis and cuneatus, arise from the spinal ganglion cells and ascend in the dorsal funiculus to the medulla oblongata. The gracile and cuneate tracts carry information about proprioception and light touch. The gracile tract is positioned medially and predominantly carries sensory fibres from the lower body below T6, while the cuneate tractis positioned laterally and predominantly carries fibres from the upper body above T6. The fibres within the gracile and cuneate tracts cross completey in the brainstem and form the medial lemniscus, which in turn projects to the anteriobasal nuclear complex of the thalamus. Conveys proprioception, light touch and vibration. From spinal cord interneurons. It has two tracts a) Posterior Spinocerebellatr Tract, which relays via inferior cerebellar peduncle and b) Anterior Spinocerebellar Tract relays via superior cerebellar peduncle to the cerebellum. It conveys proprioceptive information and on-going activity in the spinal cord interneurons. ↑ 2.0 2.1 2.2 2.3 2.4 2.5 2.6 2.7 2.8 2.9 Moore KL, Agur AM, Dalley AF. Essential Clinical Anatomy. Philadelphia: Lippincott Williams & Wilkins; 2002 Mar. ↑ 4.0 4.1 4.2 4.3 4.4 4.5 4.6 4.7 4.8 Rohkamm Reinhard. Color Atlas of Neurology. Thieme; 2014 Sep 2. ↑ Spinal Cord. Blausen Medical. Retrieved on 26 January 2016.